1) Brief Description: Many times, when installing Surge Protective Devices (SPDs) to protect groups of individual circuits, the situation arises where you might need to use several different types of units, or models in a small area. This may be because you have multiple individual circuits to protect, it may be advantageous to tie the ground or neutrals together on several SPDs, or all of the SPDs may need to be housed in a weather proof enclosure. This situation often calls for a custom assembly. Many times, contractors do not have the time or expertise to construct such an assembly, or having the contractor perform this operation may be cost prohibitive. Applications like these can be addressed by using the Pre-Packaged Assemblies, also referred to as “PPAs”, from Surge Suppression, LLC (SSI). 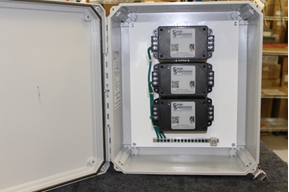 A) Three series-connected SPDs for individual power circuit protection in a NEMA 4X composite enclosure. The SPDs are mounted to the backplane using DIN rail. The units share a pre-wired, common ground point and ground bus bar. 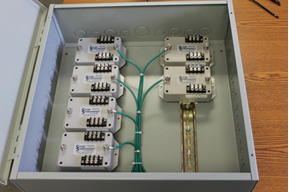 B) Six data SPDs for audio protection in a metallic NEMA 1 enclosure. 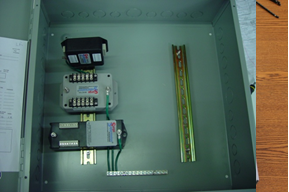 The SPDs are mounted to the enclosure using DIN rail and have a pre-wired common grounding point through the bus bar. Notice that the enclosure is equipped with pre-punched knock-outs. C) Multiple series-connected SPDs with pre-wired terminal blocks, utilizing three sides of the custom metallic enclosure for protecting multiple individual lighting circuits. 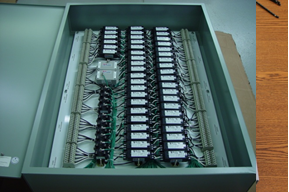 This assembly has each connection – phase, neutral and ground - individually pre-wired and marked to correspond to the circuit to be protected. This pre-wiring and marking allows for a more efficient installation by the contractor on site. The SPDs also share a common ground point through the grounding bus bars. The SPDs are mounted on DIN rail for easy interchangeability. D) This PPA includes a combination of series-connected power SPDs with pre-wired terminals , RJ45-connected data SPDs and Current Loop SPDs in a metallic NEMA 12 enclosure. The power SPDs are pre-wired to terminal blocks. All the SPDs share a common grounding point through the bus bar installed in the PPA. E) This metallic NEMA 1 enclosure has two types of Data SPDs and a Current Loop SPD and includes space for future expansion. 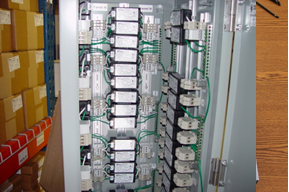 Notice the additional DIN rail and bus bar grounding positions available to the installer as needed. 3) What do we need to know? If you have a need for a Pre-Packaged Assembly we will need to know a few things to get started. A) What do you need to protect? That is, which SPDs do you need? How many circuits are being protected? B) What kind of enclosure do you need? Do you need a NEMA 1 metal, a NEMA 4X Composite, a NEMA 4 with a clear lid, etc? There are many, many options available for use. C) What kind of wiring do you need? Do you need the grounds prewired? Neutral and ground? Or do you need terminal strips on the input and output? This should be customized so that the time it takes for on-site installation is minimized. When you request a PPA, we will develop a design and give the PPA a model number for that particular assembly, based upon the SPDs required for the installation, the necessary enclosure and method of wiring that is needed. That may appear to be complicated, but it is necessary to build the part number uniquely and correctly. Below is a general description of the model number. Conclusion: Pre-Packaged Assemblies can make the application and installation of multiple SPDs much easier for complex systems that have many individual circuits to protect. They also provide an equipotential and singular grounding point for systems with multiple types of circuits, such as power, data and communications. PPAs can provide the needed environmental protection, utilizing an enclosure selected specifically for the installation. By putting multiple surge protective devices in one enclosure, PPAs can simplify the wiring, reduce the installation costs and help ensure proper performance of the SPDs selected for the application. PPAs are a proven method to maximize the benefit of your investment in SPDs.